Installing through a household door requires being able to make a hole through the door. 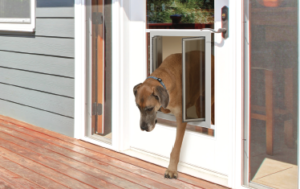 If you feel confident with measuring and cutting the hole, installing the pet door is usually a breeze. Pet doors through walls can be more challenging, depending on the material in your wall. Many people do it themselves, but it’s important to know there might be unforeseen cables or ducts in the wall. Installing through glass normally requires a new sheet of glass that must be cut before it’s tempered. This is not a do-it-yourself project. However, the process is much easier with the new PlexiDor glass insert that is available for most French, Patio, and Sliding Glass door sizes.